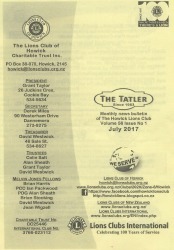 The Tatler is the monthly news bulletin of Howick Lions Club. Our award winning newsletter has been published since 1963. The newsletter is sent to past and present Club members, and our wider 'Friends of Howick Lions' network. If you have any news or upcoming events that you believe would be of interest to our readership, then please do not hesitate to contact us.